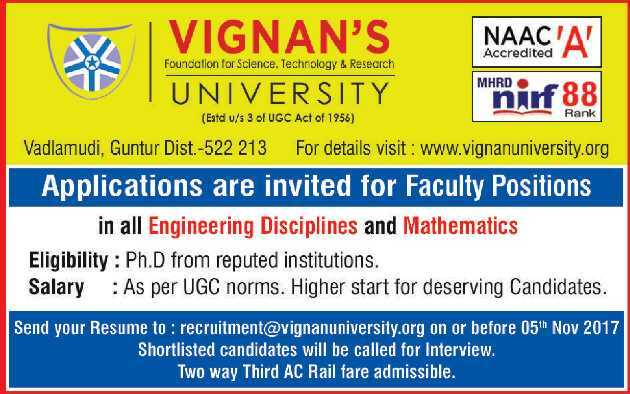 Vignan's University Guntur has advertised in THE HINDU newspaper for the recruitment of Teaching Faculty jobs vacancies. Interested and eligible job aspirants are requested to apply on or before 05th November 2017. Check out further more details below. University Profile: Vignan's Foundation For Science, Technology & Research University is a private university in the Guntur district Andhra Pradesh, India. It is in the rural area of Vadlamudi, on the southeastern part of Guntur City, a noteworthy focus with a few universities get ready understudies towards the actually difficult society keeping in mind the end goal to fabricate expertise India.